I served as an anonymous peer-reviewer for the Journal of European Public Policy, JCMS: Journal of Common Market Studies, and Les Champs de Mars. Strategic Autonomy and the Defence of Europe. On the Road to a European Army?, by Hans-Peter Bartels, Anna Maria Kellner, Uwe Optenhögel (dir. ), Bonn: Dietz, 2017. Les Champs de Mars, 30, 2018, pp. 152–154. 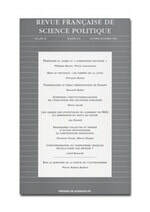 "Le patriotisme cosmopolitique ou la voie introuvable", (Cosmopolitan Patriotism, an Impossible Way), Revue française de science politique, 57 (3-4), 2007, pp. 495–499. Critical Review of Europe, la voie kantienne. Essai sur l’identité postnationale (Europe, the Kantian Way: Essay on Postnational Identity), by Jean-Marc Ferry, Paris: Cerf, 2005.